So I’ve been having a wild and crazy month, and after enjoying/squandering my day watching the new Arrested Development I feel the need to do a bit of a recap on my life for you folks. 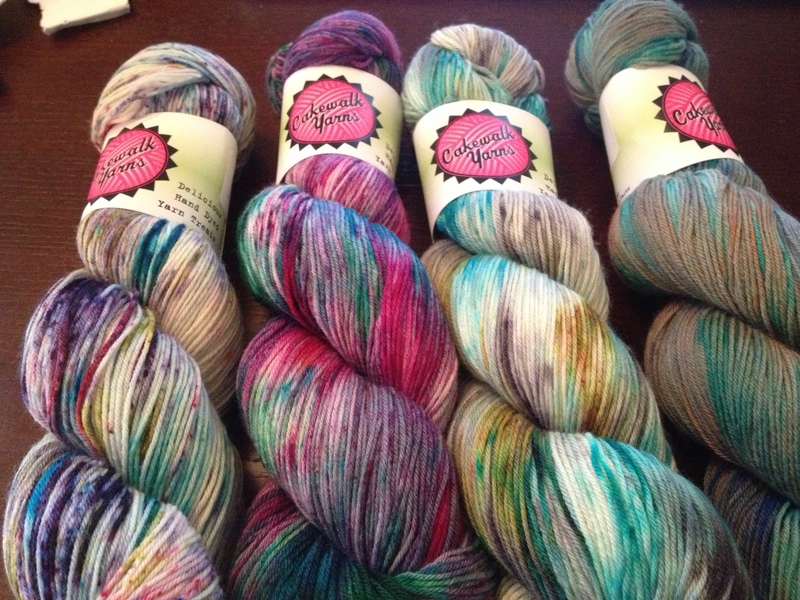 So after learning about Nancy passing away I went on a bit of a yarn binge and bought a whole bunch of the Arrested Development themed sock yarn from Cakewalk Yarns. She was having a sale and I was having a rough day and I ended up placing an order. 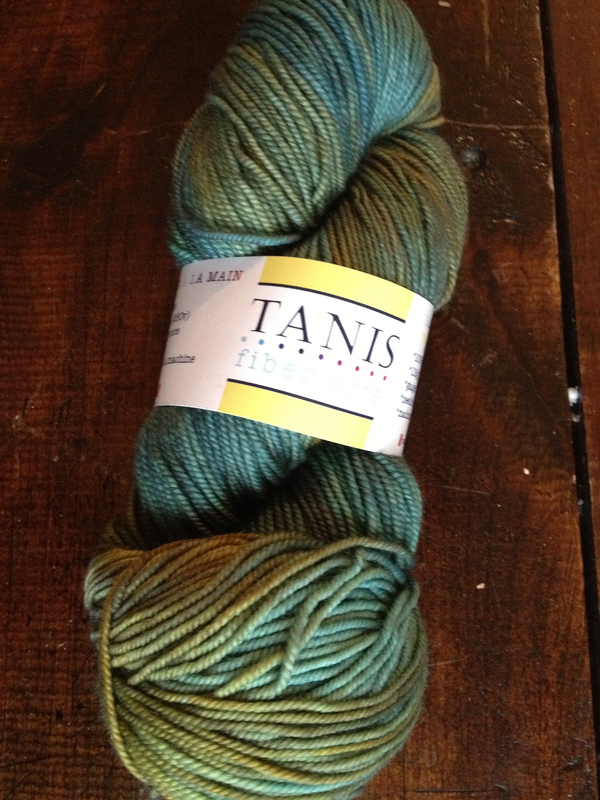 I also placed an order with Tanis (of Tanis Fiber Arts) and got more yarn. 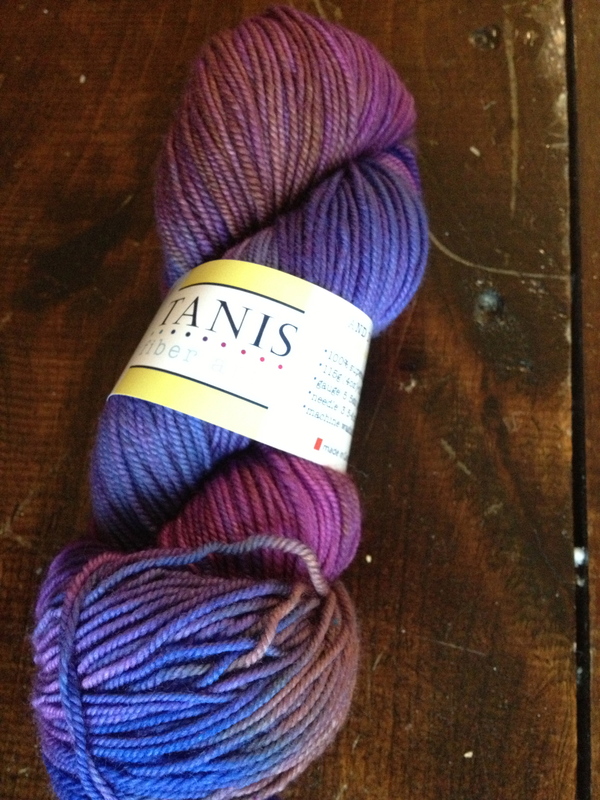 And the May club shipment showed up as well, but Carla and I did a swap so that each of us could make a large shawl out of the club skeins. But I did finish a pair of socks, this pair is from the TFA Year in Colour Club shipment. The color and the pattern were named Patina. The color is exclusive to the club but the pattern will go on sale sometime next year. Meet my new wheel, Claudia. She is named for Lady Bird Johnson, who was actually named Claudia and founded the Wildflower Center in Austin where I worked and does amazing work. She was a neat lady and it seemed a good a name as any. I also have a new addition to the family. I had a Monday off a couple of weeks ago and I made the drive to Gemini Fibres to try out different wheels and figure out which one I wanted. Instead of waiting, I decided to take home my new wheel, a Schacht Ladybug. 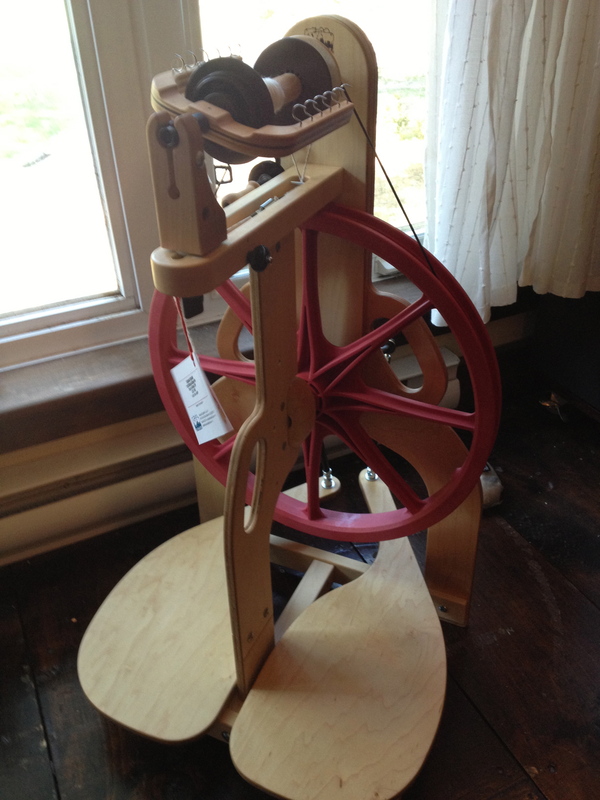 I strongly considered the Lendrum Double Treadle wheel, but the Ladybug really was the best fit. We are already making beautiful yarn together. 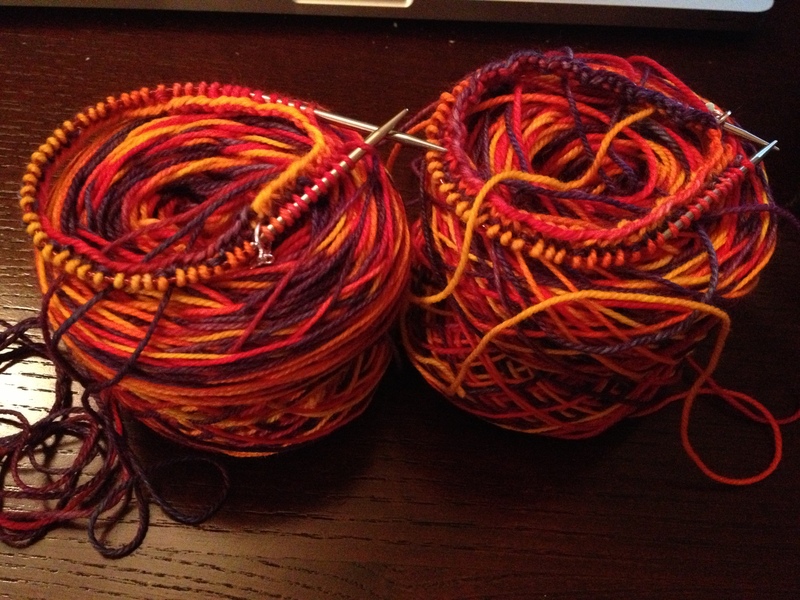 I’ve also cast on for a new pair of socks, but my knitting mojo is totally bleh right now. Which is very unfortunate because I have some serious knitting to get done. 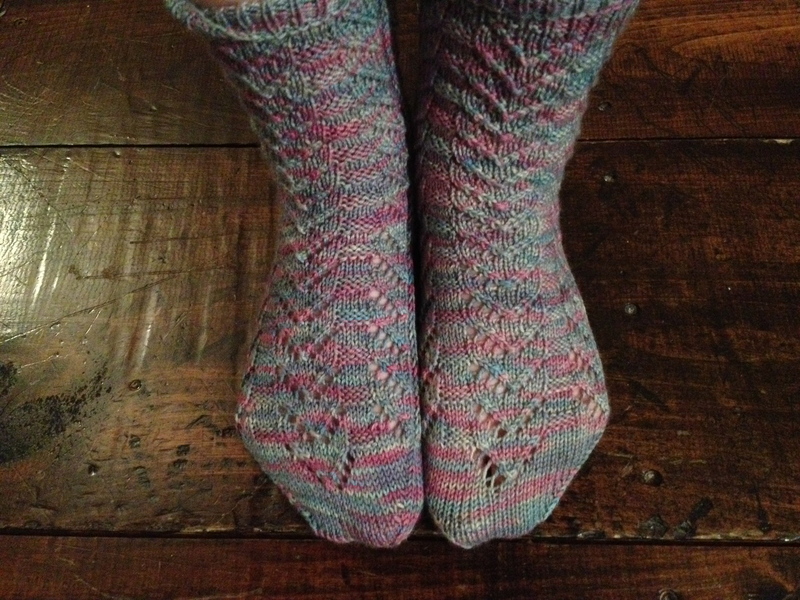 I’m looking forward to knitting and wearing these socks, the pattern is Harvest Dew by Rose Hiver and the yarn is Muskoka Sunset from Blueberry Pie Studio. On top of that knitting I have a wedding shawl to knit for my sister and a shawl for me to wear at her wedding. I had cast on several weeks ago with the beautiful gold yarn she had ordered from Sweet Georgia Yarns, but I couldn’t make myself knit it. However, my reticence was a good thing, because after some serious wedding planning with Carla and our mom last weekend we realized that it would be better for me to knit a pi shawl out of a cream colored yarn to be used as a veil rather than a shawl. The pattern I’m using is Heliotaxis Pi Shawl by Renata Brenner and the yarn is an undyed silk from Handmaiden Yarns that Carla bought on her trip down east last summer. 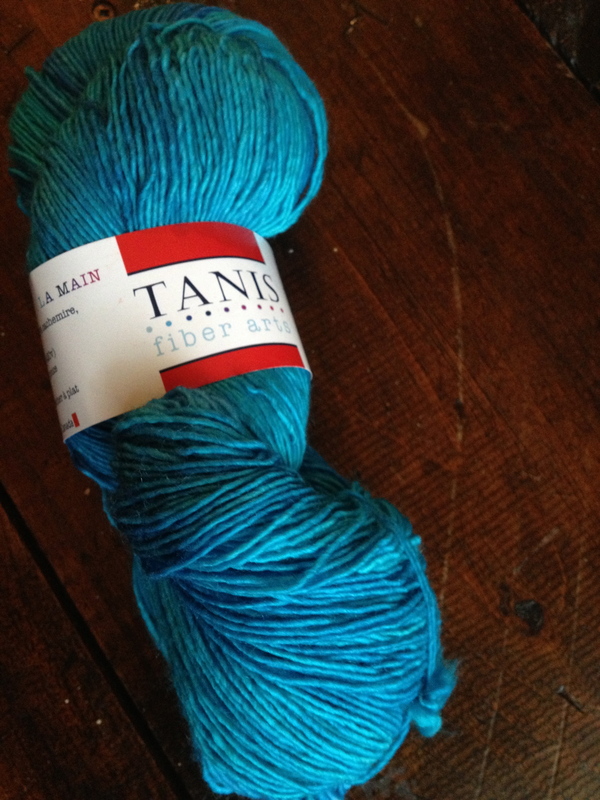 I ordered a second skein so that it will be a full sized pi that can be used for future big events, like babies. 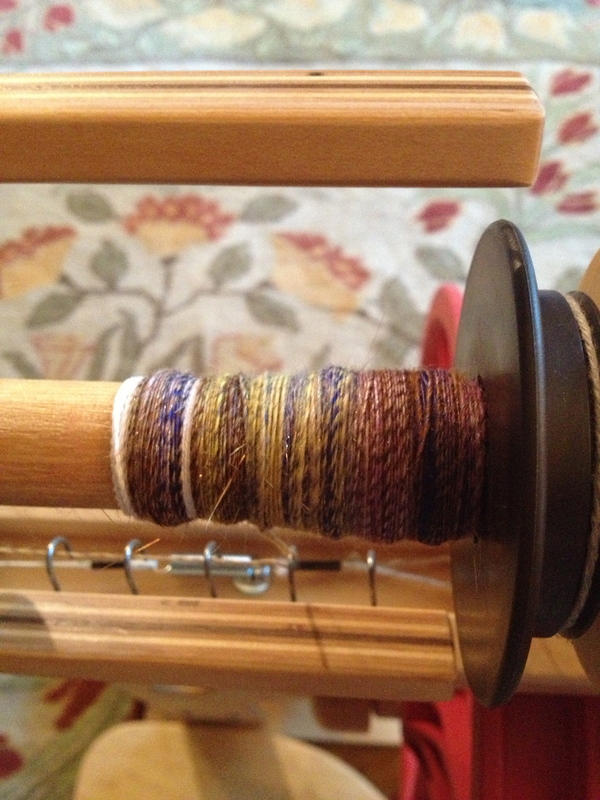 Another big thing going on is that I’m now a proud owner of two boat shuttles, because I’m borrowing one of the Trillium Handspinners and Weavers Guild Dorothy table looms for a workshop with Jette Vandermeiden in June. The guild had the loom but not shuttles, but now I’m worried I’m going to enjoy multi-shaft weaving a bit too much and want a table or floor loom. 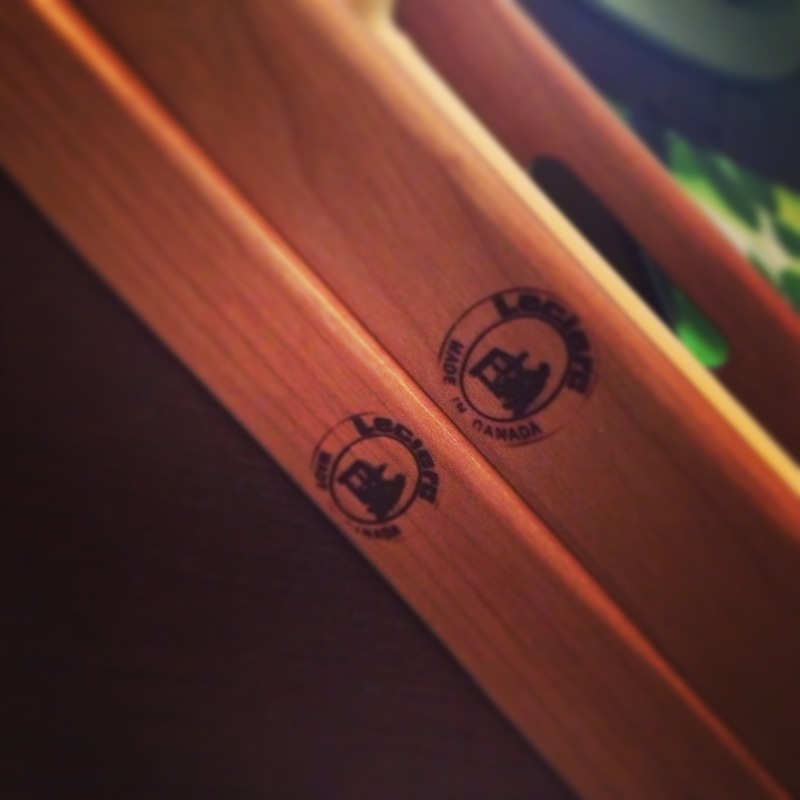 Also, the guild has a brand spanking new website, www.trilliumguild.com, which I created. It’s still a work in progress, but this is a big step forward. 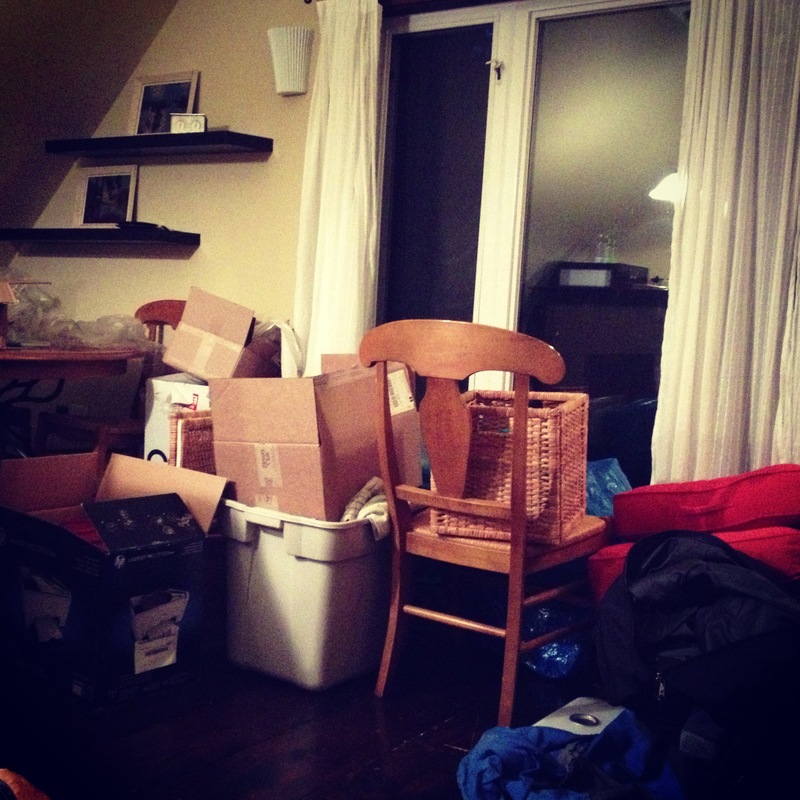 The biggest thing going on, and a likely cause for my lack of crafting mojo, is that I’m moving on June 1st. I found an apartment in Downtown Bracebridge, within walking distance of work with a balcony that faces the Muskoka River. I’m currently in the process of packing all my things and getting ready to go. But living in the mess I’ve created is really impacting my mental health. The new spot is amazing. It doesn’t have nearly as fancy floors but it has closets and cupboards that close and I can store my yarn in a far more useful and attractive way. I can’t wait to get moved into my new place and get my life back to normal again. So, today was a great day of packing, Arrested Development and an impromptu visit from Carla and Jim (which included lunch at the Old Station, a peek at my new office and a trip to the Muskoka Brewery’s new location). I’m hoping this week goes quickly because I wanna get moved and get out of the mess I’ve made for myself in my apartment.